Just days after debuting his new single on the 54th ACM Awards, country music superstar Blake Shelton has released the music video for “God’s Country.” Directed by GRAMMY Award-winning director Sophie Muller, the compelling video was shot in Shelton’s home state of Oklahoma and features the wide spanning land of the Midwest. The broadcast video premiere is exclusively on CMT and across all Viacom platforms. The video will also be featured on billboards in Los Angeles and Times Square in New York City in partnership with YouTube. Shelton brought the ACM Awards crowd to their feet on Sunday night with his TV debut performance of “God’s Country.” Billboard praised Shelton for “never waver[ing] in his conviction of the new track, and gave the ACMs one of its many highlights,” saying the “chest-thumping anthem” laid the groundwork for “one of his most fiery performances to date.” Written by Devin Dawson, Michael Hardy and Jordan Schmidt, the single is already skyrocketing up the charts as it is currently No. 25 on the Billboard Country chart and No. 27 on the Mediabase Country Airplay chart. After just one week, “God’s Country” has over 3.5 million on-demand streams and has sold over 54,000 track equivalents, currently on pace to sell 30,000 more in its second week. MusicRow described the track as “dark and passionate, with a Bocephus outlaw vibe,” while Rolling Stone named the “Southern-rockin’ country stomper” on their “10 Best Country and Americana Songs to Hear Now” list. Shelton says he first heard the song when he was working on his ranch in Oklahoma. He immediately wanted to record it, despite no plans on releasing an album in 2019. Pollstar recently placed the platinum-selling entertainer on their “Top 100 Tours in Q1” list for his Friends & Heroes 2019 Tour. Featuring special guest Lauren Alaina and with special appearances by the Bellamy Brothers, John Anderson and Trace Adkins, the arena run sold out all 18 dates and was one of the only nine country tours to make the list. 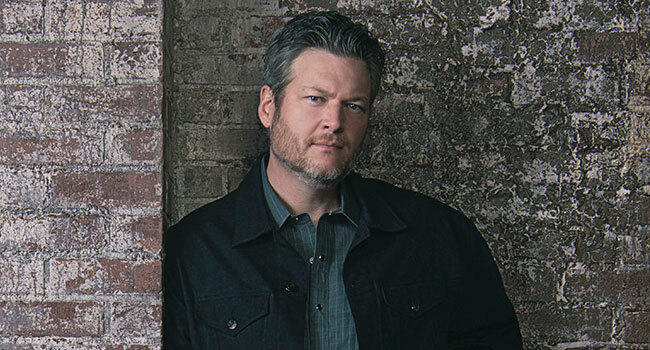 Outlets from all over praised the tour including the Indianapolis Star, Des Moines Register and The Buffalo News, who declared, “Blake Shelton brought his good ‘ole boy charm and musical chops… delivering without flaw what his fans came to see” and praised his “high energy, easy-going banter and good humor.” Shelton is back to his coaching position on season 16 of NBC’s The Voice, with the live shows kicking off on April 29th. The chart-topping entertainer is continuing to make strides in the country music community, most recently walking away with a GRAMMY nomination for his hit single “I Lived It.” Adding to his accomplishments, Shelton scored his 25th No. 1 single with his Gold-certified smash “I’ll Name The Dogs.” Both hail from his most recent album Texoma Shore, which became his sixth record to debut at No. 1 on the Billboard Top Country Albums chart and marked his 11th all-genre Top 10. No stranger to awards shows, he has been recognized for countless honors throughout his career including 20 ACM nominations and both the male and overall Video of the Year trophies at the 2018 CMT Awards. Just last month, Shelton added to his Ole Red entertainment restaurant venues, a partnership with Ryman Hospitality, by opening a new location in Gatlinburg, TN, joining the Nashville and Tishomingo, OK locations.